There are several different meanings of the word “eclipse” listed in the Oxford English Dictionary. It is used as a noun or verb to describe the obscuring or blocking out of light or to characterize the loss of power or significance of something, in a replacing or overshadowing kind of way. One of its most well-known uses, though, is in the event of celestial objects being blocked by others from an observer’s point of view, such as in a lunar or solar eclipse. There are several types of lunar and solar eclipses, but it is generally agreed that the most magnificent among them are perfect total solar eclipses. A perfect solar eclipse occurs when people’s vision of the Sun is obscured at just the right size and position by the Moon to barely cover the Sun in order to see the Sun’s atmosphere for the longest amount of time: a minute or two. This natural phenomenon has several symbolic implications that can be explored in an attempt to discover God’s tender messages in nature for humanity to find. There are many factors that are considered when trying to create the ideal situation to view a perfect solar eclipse. The size of a moon and sun, as well as their respective distances from the observer, must be the correct ratio to each other. If they aren’t, the moon will not allow the viewer to see the ring of light from the sun’s atmosphere or the sun will not be entirely eclipsed by the moon. The fact that the proper conditions for viewing eclipses are related to conditions for a habitable planet is something that could be dismissed as merely coincidence. However, it would not be far-fetched to view this correlation as an indication of a greater power at work; in other words, perhaps perfect solar eclipses are not simply celestial bodies aligning on chance, but the creation of a celestial being. 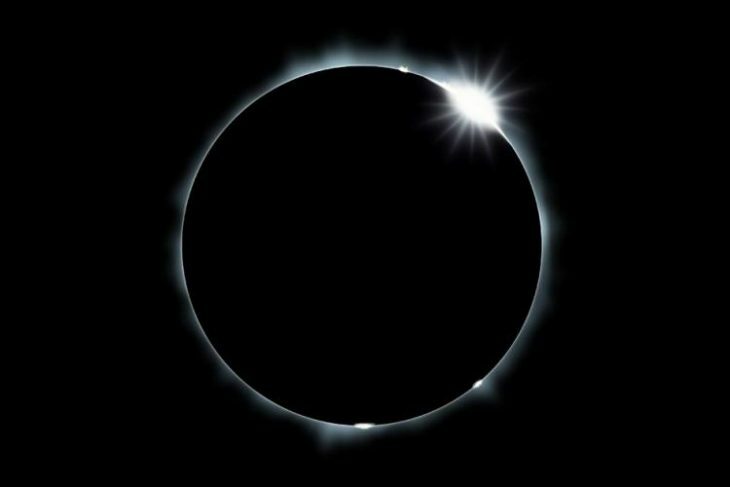 If there is more meaning behind eclipses than pure happenstance and a higher power, such as God, intentionally created an ideal place to view solar eclipses, what message or meaning is there to interpret from them? An interesting idea is to compare a total solar eclipse to the incarnation of God in Jesus. In this comparison, Jesus is the Moon and God is the Sun, while humanity is observing from Earth. Regarding total solar eclipses, the study of eclipses has granted people more insight on the Sun, the Earth’s relationship with the Sun, and the universe around them all because of the Moon’s interference. Examples of these include people learning about the Sun’s atmosphere by viewing the corona, and people proving Einstein’s theory of relativity with the use of total solar eclipses to view the light from stars bending from gravity around the Sun. Historical accounts of past solar eclipses have given insight into Earth’s rotation and allowed for modern historians to have an accurate method of measuring ancient calendars to modern ones. Before Jesus lived, people had a consistent and predictable expectation of God that was accepted for what it was. Jesus’s life, viewed as an event, opened peoples’ eyes to learn about different aspects of God’s character, their relationship with God, and the way the world works. Jesus displayed a very practical and loving aspect of God by taking human form, and while this confused people at first, it gave people a clearer version of who God is to look at. One could say Jesus “eclipsed” people’s traditional view of God in order to help them learn more about the true character of God and the nature of their relationship. Jesus demonstrated grace that was not shown in the Old Testament law, and he debunked the old system of keeping distance between God and people because of sin. He taught on how the world should be, and he taught on how the world is despite that. One could also look at Jesus’s life as casting a shadow on the world at the time. After all, Jesus’s perfection and holiness as a human contrasted with the people around him emphasized both God’s bright goodness and humanity’s cold sinful nature. It is important to remember amid this speculation that these ideas are purely that: speculation and ideas. Most people do not immediately see all these comparisons between perfect solar eclipses and the perfect man, Jesus, who was God in flesh. Rather, they experience an astonishing natural event that leaves even the most academic and scientific of scholars awestruck and speechless. Southern Wesleyan University had the incredible opportunity to witness a perfect solar eclipse last August. On August 21, 2017, people flocked to the quaint town of Central that was not only directly in the path of totality but essentially the center of the eclipse’s path. This gave people the luxury of witnessing perfect totality for over two minutes that afternoon, a privilege unparalleled from an astronomer’s perspective. There is no reason why Central deserves to have an eclipse pass over it so perfectly any more than another city or town. Perhaps this can be another comparison to Jesus of Nazareth. Regardless of interpreted meaning, the event will not soon be forgotten in the area, but people should be intentional about exploring the deeper workings of our world. An example of perfect alignment could just be a coincidence, but if it was more, it would be disappointing to miss out on whatever message such wonder could be conveying. It is not too far-fetched to believe that, as with the rest of creation, God made eclipses to reflect his greater story and goodness in our world. After all, most people aren’t going to say no to a ring that beautiful.